Christine Kröncke London. German Furniture London. German Lighting Design. 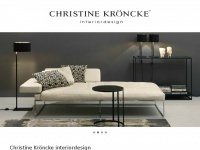 Christine Kröncke Interior Design Services for private clients, developers and B2B trade partners. Christine Kröncke UK Brand Agency. Christine Kröncke International Sales. A profile of Christinekroencke.co.uk was found on the social network Facebook. The web server used by Christinekroencke.co.uk is located in Ottawa, Canada and is run by Shopify. There are many websites run by this web server. The operator uses this server for many hosting clients. In total there are at least 11,257 websites on this server. The language of these websites is mostly english. A Nginx server hosts the websites of Christinekroencke.co.uk. The website uses the latest markup standard HTML 5. The website does not specify details about the inclusion of its content in search engines. For this reason the content will be included by search engines.